GraphQL is a fairly new technology that will let you adjust your data requirements on the fly and increase the efficiency of your app while keeping your current stack. 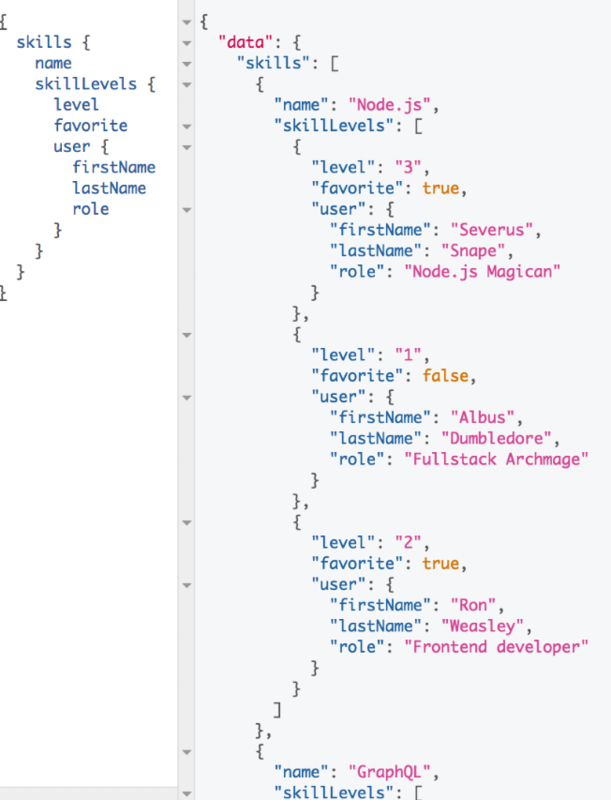 If you ever wondered how to get started with developing GraphQL API using Node.js, you are reading the right article. We will learn just enough to help you get started developing real world APIs. If GraphQL doesn’t sound familiar to you or you want to find out why it might be the best way to serve data in complex applications, we have an article about it here. At Netguru, we have an app called Profile, which we use in the process of assigning developers to projects. The app’s main function is searching for Netguru staff members with particular skills (e.g. GraphQL), which are regularly updated within the app, or searching for complete teams (e.g. a list of every front-end developer in our company). Profile’s role in managing teams at Netguru grew rapidly in recent months and that’s where the idea to make a mobile version came from - along with the notion to create a brand new API for it. We’re building an app with React Native and we have chosen Node.js and GraphQL for the backend. In the image below you can see how our API works. We will query available skills in Netguru, then check how good certain users are at them. This way we can request just the right amount of data without having to create countless endpoints. We are about to find out how it’s done, so get ready. Before getting started, you should have Node.js installed, preferably the newest stable version. We have eslint in our project because it will allow us to keep the code clean. We have included precommit to avoid committing code that does not pass elint tests. We are going to use es6 and its awesome features, so if you aren’t familiar with es6, you might want to watch videos like this one and this one. The first thing we are going to do is download the tutorial starting point from Github and install it’s dependencies. You can find the link to it here. Once we are in our application folder and we have dependencies installed, we will need to set up the database. Our application uses MongoDB and that’s what we are going to use in the tutorial. We will store our data online using the cloud database service MongoLab. 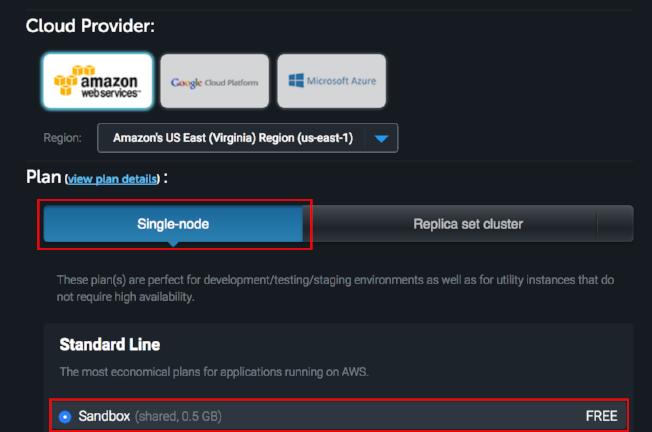 Once you pick a name click ‘Create New MongoDB deployment’. We need to create a user now so click on the newly created deployment and click on the Users tab. Use a password you’ll remember since you will need to connect to the database. We will use it in a second! I created a script which will place seed data on your server. If you visit your MongoLab deployment you’ll see three collections named users, skills and level_skills. As you can see in the console we can also visit our GraphiQL on port 8000. GraphiQL is an API used to test GraphQL endpoint by providing access to it and visualizing returned data. On top of that it supports autocompletion and provides descriptions of our requested fields. The next part of the tutorial will deal with working on creating ways to query our data as we please. Now beware! 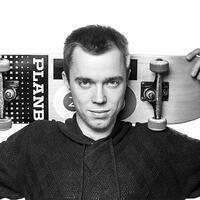 We will experience what is probably the most sophisticated API on the market, GraphiQL. Visit localhost:8000 in your browser to see what it looks like. You should see the automatic documentation system in action. Not only is the data we request strongly typed, but we can also see what types will return from the query. On top of that, every field can be described as we please and that description will be visible. Queries are capable of much more than we can cover in one article so you might want to read about them here. At this point we have one query field defined and it doesn’t really do anything useful, so we can truly start developing our schema from the very start. We need to add a query field for users. 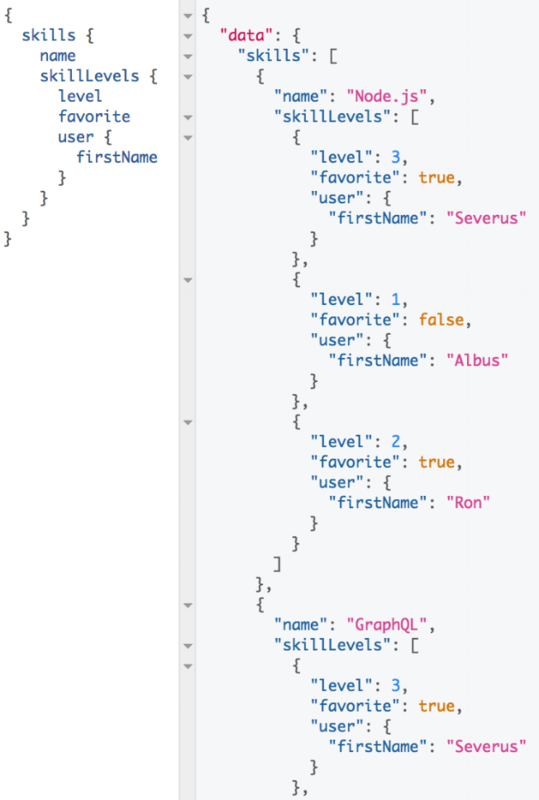 GraphQL defines a set of types which we can use to describe our user. To put it simply, we can say that user has a field firstName which is of type string. Types are well explained in official documentation. You can learn about them here in case you want some more insight on what they are. We will now create a GraphQLObject type for user. 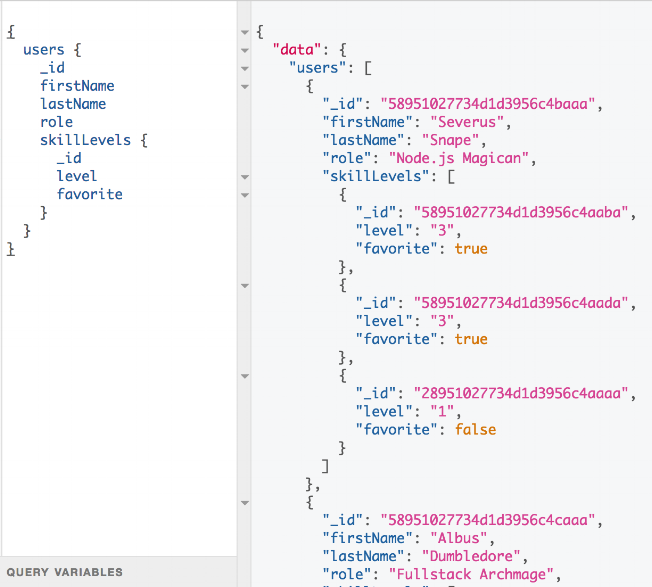 To see what kind of fields user might have, visit server/appData/models/user.js. What we have there is a model and it tells you that user can have fields such as: firstName, lastName, role and _level_skills. 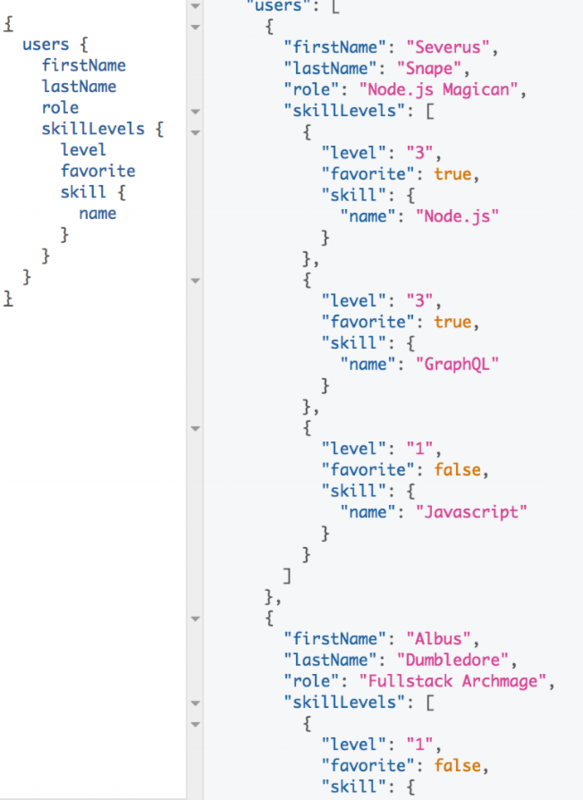 The _level_skills field returns an array of identifiers and we will handle it soon. 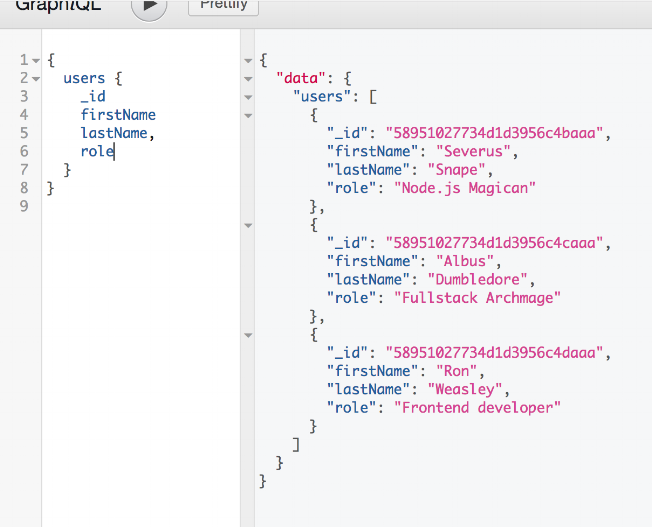 For now we will only handle four fields which are _id, firstName, lastName, role. To see if everything works, restart the server in the terminal. Run ctrl + c and then npm start. Disclaimer! 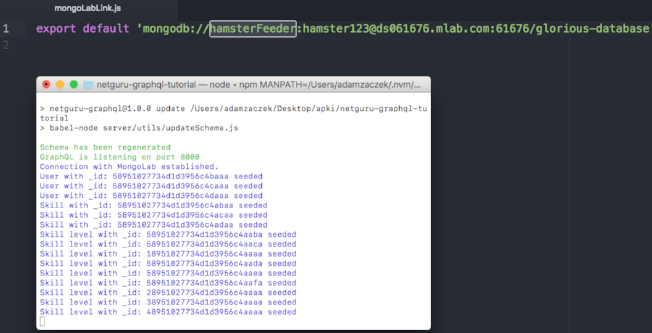 You might need to reload the GraphiQL window in your browser to see a new query field. Now visit http://localhost:8000/. You can now call users query, check it out! What we want to do is find out how good each of our users is at each programming skill. We do not have a field of either the skill level or the skill type yet, so we can’t query against that just yet. Let’s fix that! 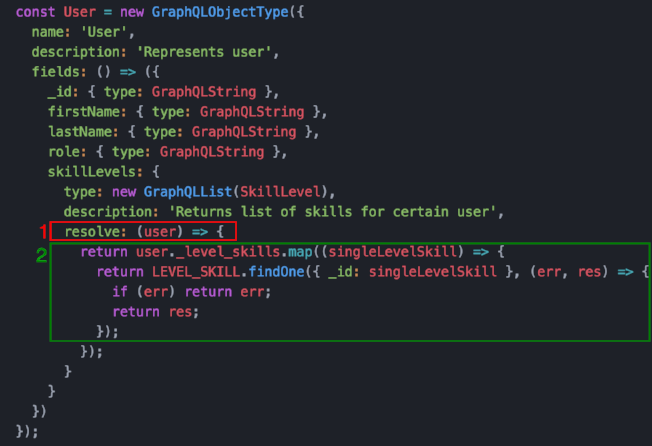 Note: Skill level model has a favorite field which is a boolean so we will need to import GraphQLBoolean just like we did with GraphQLList. We also need GraphQLInt for level field since we describe skill in integers. We are ready to do what we initially intended to do, which is displaying skill levels assigned to our users. The resolve function takes a few arguments but in this case we only care about the first one, which reflects what is passed down to the type. In our example it’s simply what we have fetched under the USER model. 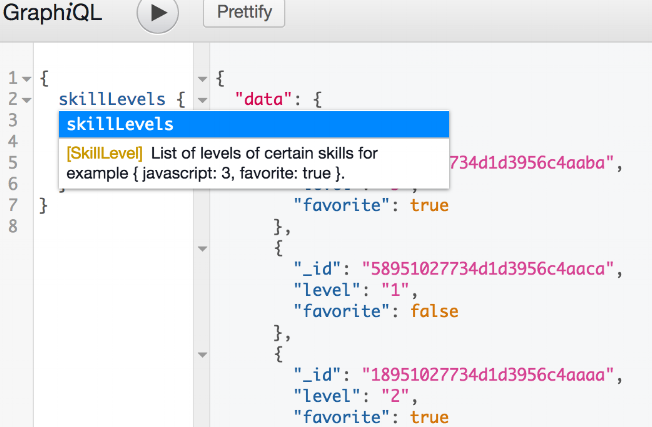 Next, we find skill levels corresponding to identifiers and put them on a list. This way we have a list of skill level objects. We can now see skill levels of our users. Take a look. To be able to query the fields as we please we should look for the owner of the skill_level field and the rated skill. We can do this with very little code. We’ve learned how GraphiQL (not to be mistaken with GraphQL) helps with documenting API. We know how GraphQL’s strong typing works and we got to know some of the built-in types. We can create objects and lists and query data as we please. query variables. Now that you know the basics, getting started with learning about all of them should be easy. We’re only adding GraphQL to existing applications when it’s the easiest and most efficient thing to do. We don’t scrap or destroy solutions that are already there and working - instead, we build up by taking the mobile app further with GraphQL. Thus, we’re taking full advantage of our assets and creating new value. Consider whether that’s not the best option for your business, too.